Plan of existing and proposed cycleways for Huntingdon Road (Source). Please keep a lookout for consultation documents hitting your doormat in the next few weeks and do go to the trouble of letting County officials know your views when the time comes. The plan is to keep the road width the same and reallocate some pavement/verge to cyclists. Hopefully much more detailed proposals will be available when the County Council begins its consultation; it’s not currently clear how far into the city such a lane would run for example. I hope the consultation is not limited to local residents; and all those who use the road as drivers, cyclists and pedestrians will have the opportunity to comment. A 60cm curb is proposed to separate cyclists from motor traffic. I suspect that’s not quite enough for grass or trees. To develop a satisfactory design will require lots of work and engagement with local residents, businesses and other establishments, to ascertain their needs in terms of deliveries, access and parking, and also their concerns about how the scheme will look, drainage arrangements, details at bus stops and so on. This entry was tagged Castle Ward, Cycling, Huntingdon Road, John Hipkin on August 30, 2013 by Richard Taylor. I can’t see any trees which would need to be removed for the installation of the proposed cycleway towards the city centre. There are no trees which could encroach on the cycleway; and those which do encroach on the footpath already do so. As for the out of town direction the existing footpath could be widened to provide a 2.1m cycle path as proposed on the other side, and a pedestrian footpath placed outside the trees. I’d like to see as much grass kept as possible. In the relatively low foot-traffic areas could strengthened grass be used as pavement? 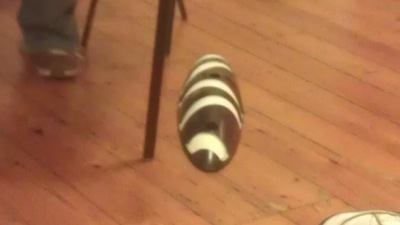 Armadillos (in two sizes) attended Cambridge Cycling Campaign’s open meeting on the 3rd of September 2013. These things, which look a bit like fancy chocolates, could be used to segregate cyclists from pedestrians on Huntingdon Road and elsewhere in Cambridge. They have advantages over curbs including being cheap and easy to fit; and cars can easily drive over or with their wheels between them if they have to get out of the main carriageway to let an emergency vehicle past. They could be fixed parallel or at an angle to the direction of travel. No decisions have yet been made; there is to be much consultation and deliberation yet to come on all the segregated cycleway proposals. There’s a lot of positives with armadillos and they could do well on Huntingdon Road. The one slight note of concern would be that do you expect the design to be similar to the picture above? Because I’d worry it’d be a lot less than that. More like straight line along the current single white line of the cyclelane. This won’t overcome large vehicles knocking riders sideways with the airwash as they speed past a foot away. Mind you, kerb-based segregation wouldn’t solve that either. At least this will give some sense of safety from being hit from behind as a vehicle “accidentally” travels into the cyclelane. What is needed is the same “dead” space in between the different mode lanes. So, we need to see design before getting very excited about it. Still think it’s a good idea, though! As I mentioned yesterday, having traveled along Royal College St using the new lane. the zebras helped subjective safety somewhat, but still didn’t feel entirely separated. However they have them positioned vertically and spaced out. Having now seen pictures of them placed more closely together and diagonally, I think that looks like a good option, with the additional advantage over a continuous curb that cyclists can easily bail out of the lane if necessary. They certainly appear to be good value for money and I think could be put to effective use in some schemes in Cambridge. My view is the armadillos, however robust, look and feel temporary; ideal for testing out an idea perhaps but not for a permanent remodelling of the city’s streetscapes. Where we’re to have segregated cycle lanes I’d like to see substantial separation of cycle and motor traffic, using curbs rather than the armadillos. Where practical I’d like to see the new islands incorporating grass, planting and even new trees. The Cambridge News has an article: ‘Armadillos’ could boost cycling safety in Cambridge it is attracting lots of mixed comments. An interesting element of the proposals is the treatment of the floating bus stops. The proposal is the cycle-lanes will narrow; and there will be a bump in them to raise them to the level of the pavement at the point intended for pedestrians to cross. Pedestrians to have priority over cyclists when accessing floating bus stops. The intersection point will be ramped, making it obvious and meaning cyclists will have to slow down. Raising the cycleway very slowly to the level of the pavement so that pedestrians, and other pavement users, who will prefer level access such as the infirm as well pushchair and wheelchair users would I think be reasonable; but placing something akin to speed bumps in the cycle way would I think detract from their usefulness and might deter some cyclists from using the new lanes. I hope councillors make sure the expectations, or requirements, on both cyclists and pedestrians are clear to avoid conflict being created through misunderstanding and differing expectations. I am surprised by the lack of detail in the report. There is a cross section, but no plan of the length of the road. One key area I suggested needed careful treatment; the start of the cycleway as traffic approaches the city from the A14 has not been specifically considered at all. @LibralLady @jbbourdu @RagazzaDelTreno @LibDemEd @jdjhiston We will be speaking about bus stop priority issue though – is anomalous. I observed the meeting on the 27th of May which considered the segregated cycleways on Hills and Huntingdon Roads. Councillors decided to defer the decision until the 8th of July. Cllr Walsh, who seconded the proposal to defer stated he felt the report before the committee could be improved substantially. Cambridge Cycling Campaign proposed a compromise position of gently raising the level of the cycleways to the level of the pavement at the crossing point to the floating cycleways. Martin, Chair of @CamCycle , is here @CambsCC #live to address the committee on the Hills and Huntingdon Rd cycleways schemes. Proposals good for drivers @CamCycle tells @CambsCC #live Segregating cyclists will make driving less stressful he says. I think @CamCycle’s suggestion of gently raising the cycle lane to pavement height at the crossing point to the floating bus stops is good. Cllr @cllrjohnhipkin says luke warm support from 50% of his residents and strong objection from the other 50% re new cycle lanes. Cllr telling @CambsCC #live that cycle lanes on Royal College Street in London are not used; due to bus stop layout. Our Police and Crime Cmmr should be ensuring @CambsCops do have input to policy decisions e.g.. introducing segregated cycle lanes. Cllr @JohnReynoldsCB proposing a deferral of the cycleways decision. That’s what I would have done too; but for slightly different reasons. Cllr @Ashley_Walsh has seconded the motion to defer the cycleway decision. He wants a better report. No detailed plans here. I agree.